With warmer temperatures, the number of joggers on sidewalks and in parks will increase. 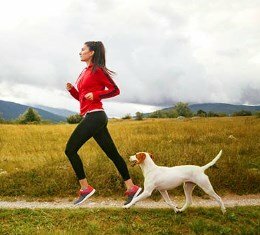 Howard Erickson, professor of physiology at Kansas State University’s College of Veterinary Medicine, says the exercise will not only be good for you, but it offers benefits for your dog as well. “It helps dogs stay healthy and maintain good muscle tone,” Erickson said. “If you don’t use your muscles, they tend to get flabby and atrophy, so it is beneficial in that regard. Erickson offers some tips for jogging with your dog. 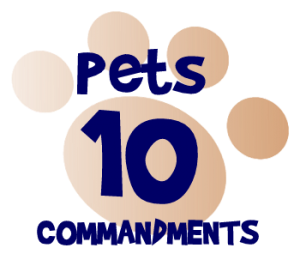 * Start younger, middle-aged and overweight dogs on a moderate program of walking 10 to 15 minutes once or twice a day. * Be careful and watch for traffic. If you’re on a street, have the dog by your left side and move against the traffic. * Keep in mind the type of surface you are jogging on. In the summer, asphalt and concrete become very hot, while grass and dirt stay relatively cool. Also, harder surfaces such as concrete could cause damage to the pads of a dog’s feet if you do a lot of heavy running, so grass might be better for jogging. * Avoid jogging if a dog has any pre-existing health problems, such as a heart murmur or heartworms. Also, some dogs can overdo it, particularly older dogs, so take notice if a dog appears to be getting tired. * During hot summer days take water along, or jog by places where there is water. * Go out early in the morning or late evening when it’s cooler, rather than in the afternoon heat of the sun. Dogs don’t get rid of heat as well as humans do. They primarily eliminate heat through panting, and they sweat through the pads of their feet, so they can get overheated very easily. * Take some precautions if you plan to jog at night. Wear clothing that can be noticed in the dark, and attach illuminated strips to your dog’s collar.